April 11, 2018 Quang Pham Comments Off on To-do or To-Snooze? 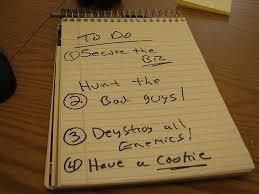 Too much to do on your to-do list? Sleep on it! It can be hard to fall asleep with unfinished tasks bouncing around our head. Many of us prepare for the next day with a to-do list. Others just write down what they accomplished that day. Can these bedtime rituals help us sleep better? Enter neuroscientist Michael Scullin from Baylor University. He gathered about sixty university students to sleep overnight in a lab. Students were split into two groups. Before bed, one group jotted down a to-do list for the next day. The other wrote tasks they’d finished from the previous days. Then he monitored the brain activities and sleeping patterns of both groups. The results? Those who wrote to-do lists fell asleep much faster than the other group. The more specific their lists, the faster they zonked out. The OPPOSITE was true for those who wrote completed tasks. Scullin believes that jotting down a to-do list before snoozing is beneficial. It reduces worry, LITERALLY taking the tasks OFF your mind. So, don’t wait TO DO that to-do list! Complete it from A to… ZZZZs!